Hop On Over To Hammond Square! by Stirling PropertiesPublished March 16, 2018 Leave a Comment on Hop On Over To Hammond Square! 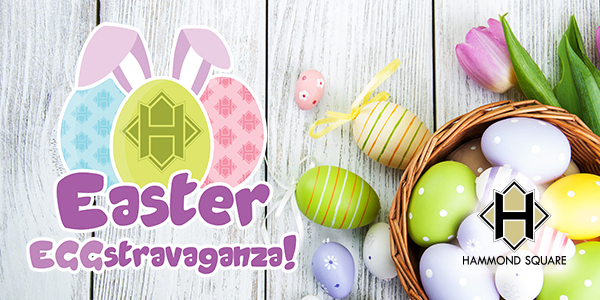 Join us for the annual Easter EGG-stravaganza at Hammond Square on Saturday, March 24th from 11:30am-1:30pm. The festivities will take place on Hammond Square Drive next to Target. This FREE event is open to the public and fun for the whole family! Come visit with the Easter Bunny. Guests will also enjoy pony rides, a petting zoo, face painting, and a live radio remote with great prizes from Kajun 107.1. Don’t forget your Easter baskets—the egg-citing Easter Egg Hunt will begin at 1:00pm featuring more than 4,500 candy-filled eggs. (The egg hunt is limited to children ages 0-12 years.) Professional Easter photographs are available for a fee at Hammond Square with Becky Blount Photography (appointments are recommended). Hammond Square is a proud sponsor of The Daily Star’s Easter Coloring Contest for children ages 7-10 years. Complete your coloring sheet and bring in to The Daily Star by Wednesday, March 23rd at 3:00pm to be eligible to win an egg-cellent prize pack from Hammond Square. Come on out to celebrate with us—and the Easter Bunny—during the annual Easter EGGS-travaganza! We hope to see you there. Be sure to check out all the great stores at Hammond Square for your Easter and spring supplies. Visit HammondSquare.com or “like” us on facebook.com/hammondsquare for a complete list of retailers and events. Have a Hippity Hoppity Easter from Hammond Square!